About a week and a half ago I went to Cross Vegas. I can say it was one of the definite highlights of Interbike week, well, the race and the friendly folks I met in the Expo booths inside the real Interbike. 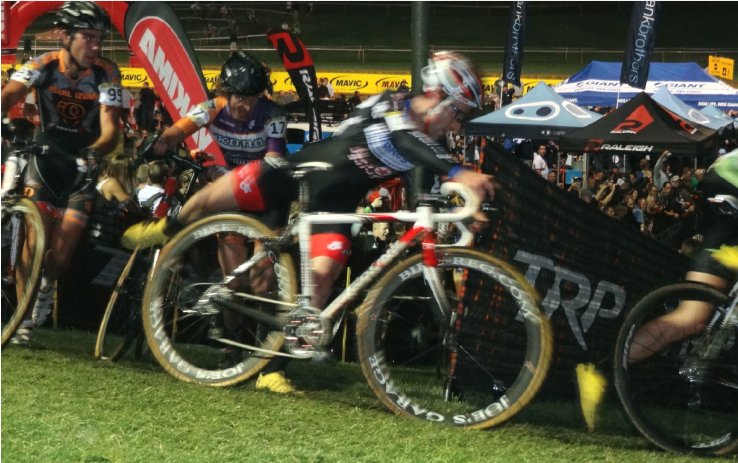 But the CX race, claimed to be "the biggest cross race in America", was pure fun. In a timely fashion I thought I'd share some photos, which depict a very small part of the evening which mainly consisted of yelling really loud, laughing harder, and eating free tacos and drinking free beer. What a perfect evening. 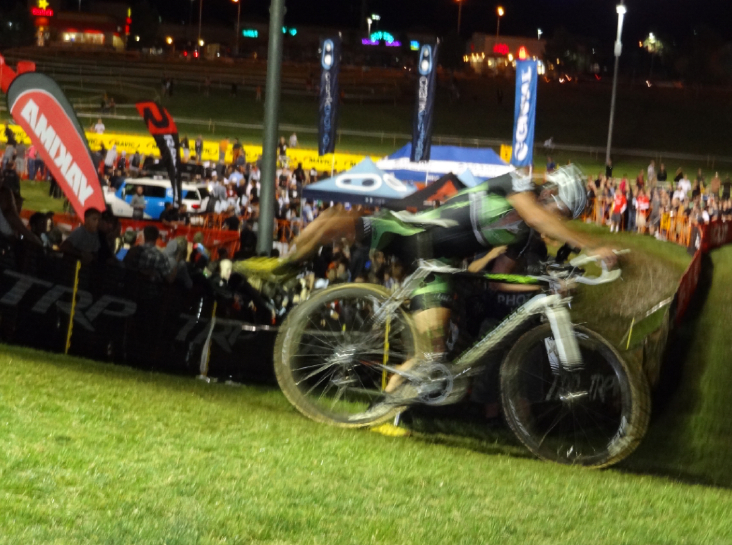 Cyclocross is meant to be fun. As a Coloradoan/former Californian finding myself in Las Vegas for a couple of days, this was the place to finally unwind and instantly feel at home. 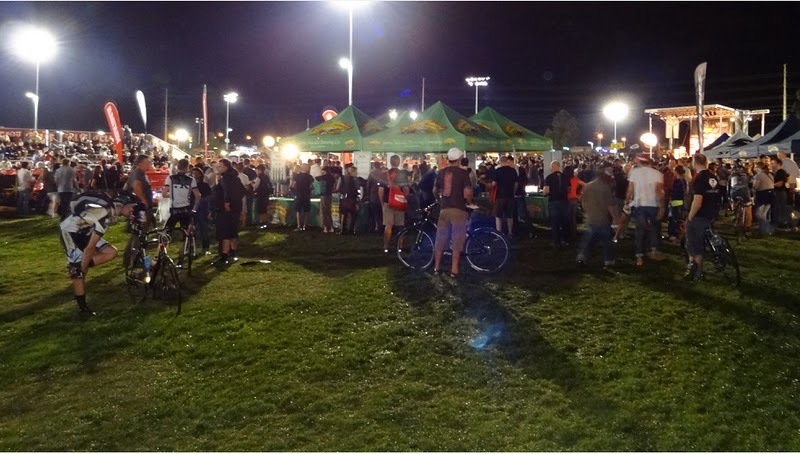 I love watching any kind of bike racing, especially a race in 75 degree temperatures and at night, and away from the Las Vegas Strip. 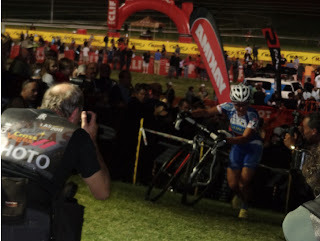 My good friend Scott Christopher from Bicycle Colorado arranged a VIP ticket for me - and you know how I loves me some VIP tickets. The VIP area was low-key, but a perfect vantage point to run from side to side to see the entire course. It also had pink girl porta potties, and I am telling you those pink cubicles with their gift of cut-in-the-front of the guys waiting in line, were worth every bit of freeness I paid for those VIP tickets. Interbike is about 96% men and Cross Vegas is about 98% men, so I was in heaven. 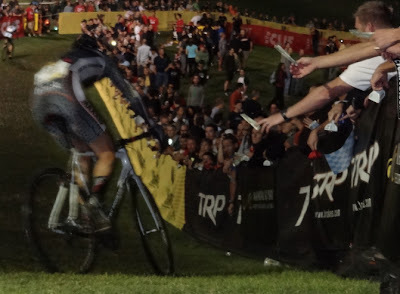 When I wasn't cutting in line, or getting more tacos or more beer, I was standing with my Colorado CX buddies cheering really loud and ringing my cowbell even louder. 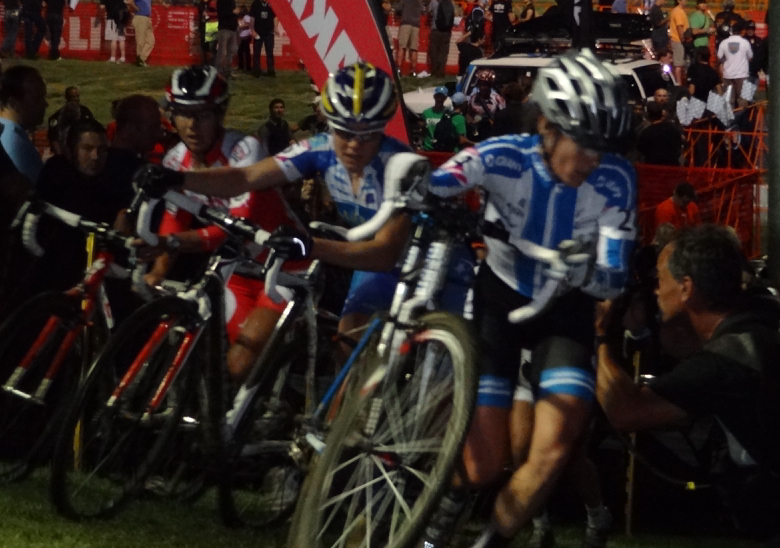 Colorado cyclocross racers know who everybody is, I do not. I know who everybody is in the world of road racing, but this is bunny-hopping, jumping on and off a bike over grass, dirt, pavement and 12" boards racing. 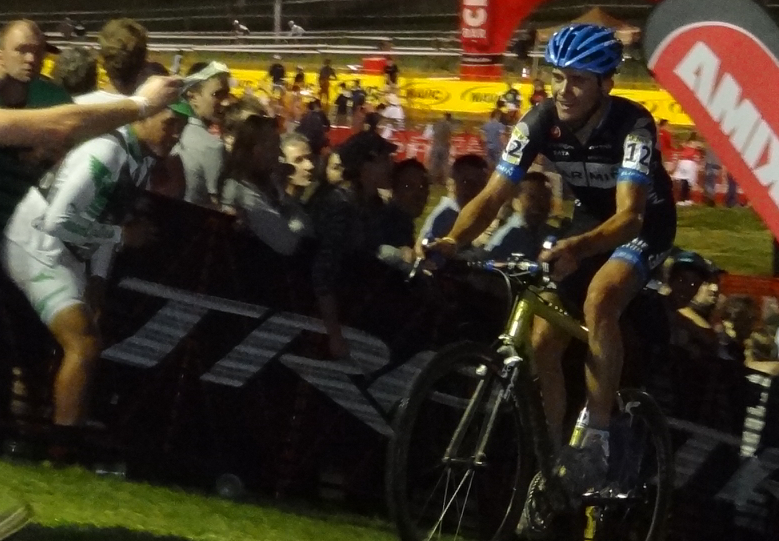 I know Todd Wells, Ryan Trebon, and Jeremy Powers, because I've seen them race a number of times. That is about it. Like all races, being a fan is where the fun was happening anyway. The main entertainment of the evening at Cross Vegas was the tradition of "money grabbing" and beer hand-ups. 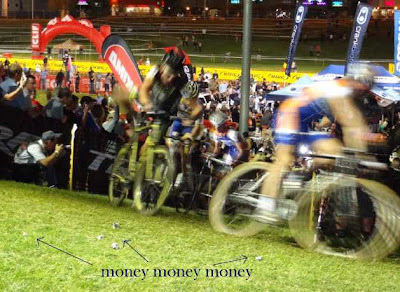 Fans would entice the passing riders to reach for dollar bills in hand or crumpled laying on the ground. Instead of the fans cheering to "go" faster, cheers of "get the money" resonated at every lap. 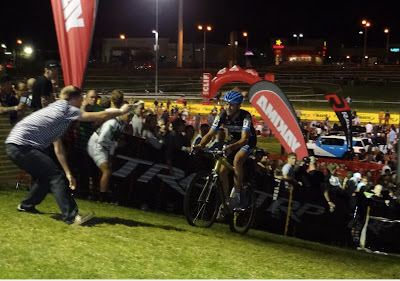 Successful grabs elicited huge cheers from the crowd. It was a blast. Danny Summerhill was one of the riders thrilling the fans. After all if a rider has no chance for a podium place, why not make a little side money. Skinsuits happen to be the perfect apparel for scooping up dollars and stuffing them up the thigh or down the zippered front. Generous fans added hundreds to some of the take-home winnings of the racers in the rear of the pack. 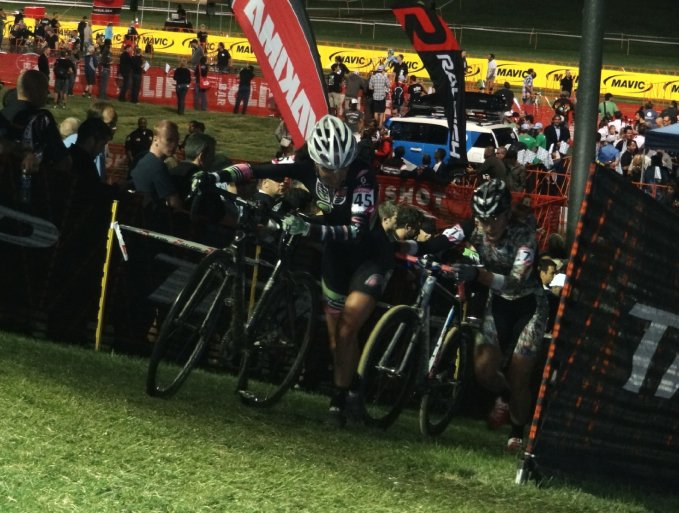 After being part of the fun of Cross Vegas, the local Colorado CX races, in 20 degree temps, are going to be so ho-hum. 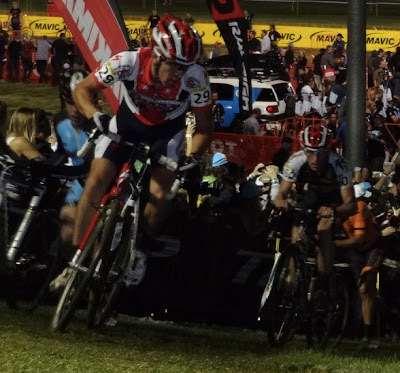 The evening at Cross Vegas started off with the Wheelers and Dealers category, this was like watching your best mates compete and get heckled. The Elite women's race followed, this was like watching the break of Georgia Gould and Katerina Nash get a 10 second lead on the field, and nothing much happening after that. 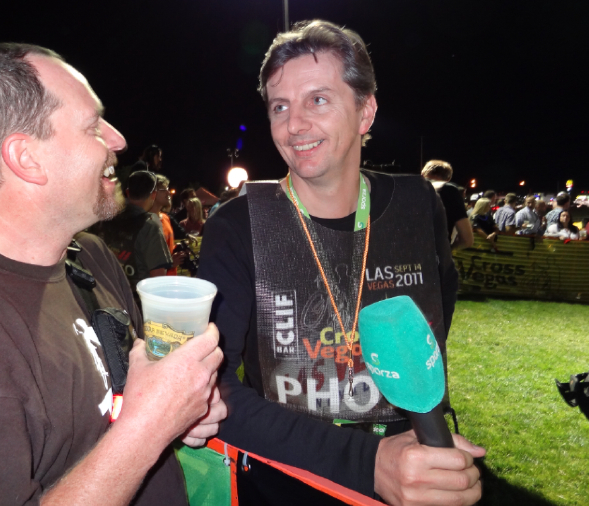 By 9:00pm all the shuttle buses had arrived, the beer was flowing, and the place was packed. The Elite men took to the field and the real fun began. Between the huge pack of photographers we could see the riders come up the grassy knoll over the barricades and take the 180 degree turn, collect a few bucks, maybe a swig of beer, remount and down the hill they went. Lap after lap of great entertainment. 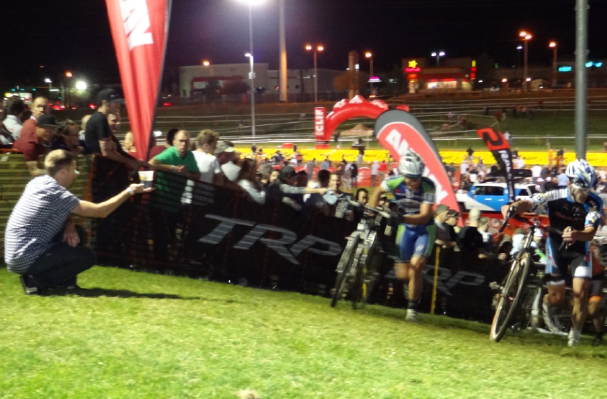 I would definitely return to Cross Vegas again in a minute, if only it wasn't in Las Vegas. Next year the date will be September 19, 2012. With today's news that the World CX Championships in Louisville, KY is vulnerable to being relocated (Louisville World cyclocross championships under threat over lack of sponsorship), it is more worthwhile to make the trip to Las Vegas to witness this level of cyclocross racing in the United States, to enjoy the venue at the Desert Breeze Soccer fields, and to see the fun of the money beer hand-ups. The women’s field included many of the strongest riders from North America including Sue Butler, Georgia Gould, Amy Dombroski and also Katerina Nash (Czech National champ who regularly races in the USA), Caroline Mani (French National champ) and Joyce Vanderbeken (former Belgian National Champ). 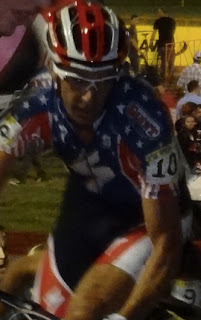 I was happy to see The Kitten of Flanders guys with their recognizable flag at the race. Also read the fun account by Podium Cafe who were at the race. Being a fan at a cross race is lots of fun.